Jesper Horsted was a testament to versatility and excellence throughout his Princeton career, and his final football game in Orange and Black was the ultimate microcosm of that. A record-setting day that saw Horsted catch, run, and even throw earned him an outright Ivy League title, another Princeton record and a number of honors, including the FCS National Offensive Player of the Week Award. Horsted, who was also the Ivy League Offensive Player of the Week and the GoPrincetonTigers.com/Suburban Transit Athlete of the Week, caught eight passes for 165 yards and three touchdowns, which helped him set the Princeton record for career receptions. He also scored on a 19-yard touchdown run, and he completed a 28-yard pass to Stephen Carlson on one of Princeton’s six touchdown drives in the Tigers’ 42-14 win over Penn. Horsted ended his career with 196 career receptions, three more than previous record holder Kevin Guthrie ’84, who was in attendance for the game and congratulated Horsted prior to awarding both he and John Lovett the Poe-Kazmaier Trophy at the season-ending banquet. 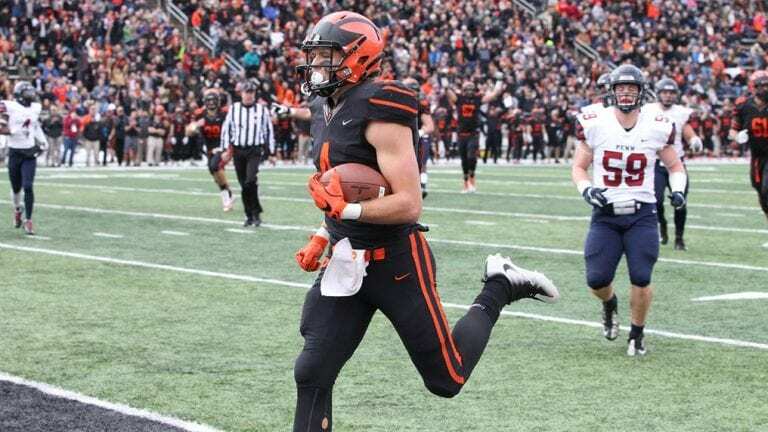 He also built on his own touchdown receptions record with the three scores; Horsted ends his Princeton career with 28 touchdown catches, while no other Tiger has ever caught 20. An All-Ivy League baseball player (read his senior feature from the gameday program here) as well, Horsted finished second all-time at Princeton with 2,703 receiving yards, only 95 behind Derek Graham ’83 for that record as well. He scored Princeton’s first four touchdowns on Saturday, including a 42-yard strike in the first quarter and a three-yard flip in the second. He also had a 19-yard run in the second quarter, but his biggest score of the game came after Penn rallied to get within a touchdown; Horsted pulled in a 20-yard lob from Lovett along the Princeton sideline to rebuild a double-digit lead. Twenty minutes later, he and his teammates were celebrating Princeton’s first perfect season since 1964. Horsted is Princeton’s first National Player of the Week since (can you guess?) Lovett won the award after accounting for seven touchdowns in a 56-7 win at Cornell.